Au moment où l'École du charme arrive en jeu, choisissez une couleur et mettez l'École du charme en équilibre sur votre tête. When Charm School comes into play, choose a color and balance Charm School on your head. Prevent all damage to you of the chosen color. 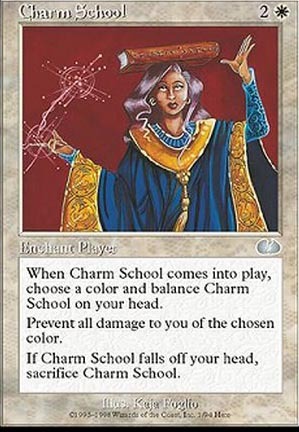 If Charm School falls off your head, sacrifice Charm School.